I was hoping to see yours fly to prove it can be done... Hopefully the 69mm fans will provide enough umph to get her airborne! Cheering you on for V3! The 3rd nacell should be easy to mount, I just need to get a few fins drawn up to put on it. When I did the testing with the props I also had an adjustable thrust cone I was using to test if adjusting that helped. I had originally designed the thrust tube to bring the exit area to 1:1 of the FSA. In the testing I found shrinking it slightly got me an extra 5g of thrust. I don't have the numbers handy, but I would guess it is probabaly 90-95%. We will see how this one flys with the 50mm edf's. I may scale it up and fit some landing gear on it. This could also be good as the larger nacells may let me keep the nacell cones in during flight. I have a little in there, it is 1/8" of drop from back to front, I don't remember the specific degree off hand. Fortunately on this plane the nacells are just glued to the end of the wings, so was fairly easy to do. I have learned on some of my other builds that the planes were built as they are for a reason. If you ignore details like that, even if they seem trivial, they can drastically change the planes performance. Sorry for the lack of updates, I have been traveling a lot for work the past 2 months and working on my FTFC19 entry along with another winter project of mine. I have completed adding the 3rd nacell with the gremlin edf to version 2. I also have version 3 built with the twin esf's, however I have been having some electrical issues with the esc's I have to sort out in regards to throttle range. The problem is that I cant calibrate the range because one of the esc's doesnt arm for 10 seconds after the first one, which at that point is beeping away for other programming settings. Unfortunately I should have done this when I was first soldering things together, because now everything is sealed in he plane. The throttle ranges are way off between the edf's to were one just starts to spin up at half throttle, and the other is at full speed. I also have a version cut out but not assembled that I am going to install 2 f-pack motors in as pushers. Once I sort out electrical issues and my schedule and the weather cooperate I will get them out to maiden. Will probably not be till mid March at the earliest. Ouch - sounds like she'll need surgery. Are they different ESCs? No, they are the same. They are slim/low profile ones I bought that were labeled for use on race quads. 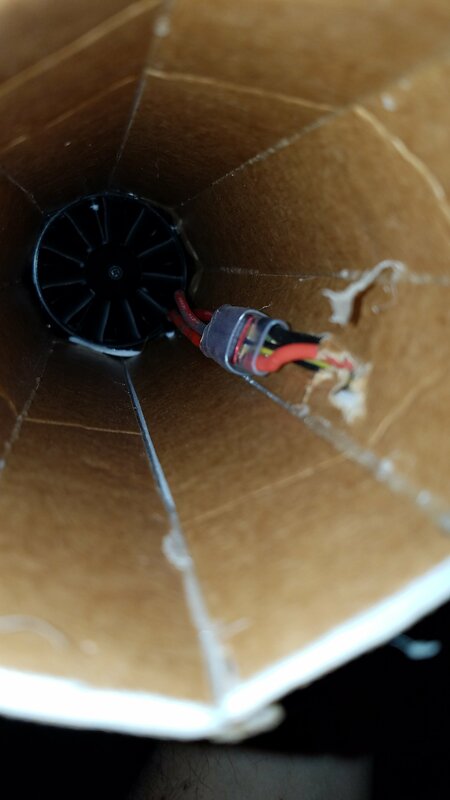 I will admit the problem could be with my soldering skills and I may have a bad connection somewhere. That's not a bad idea for the edf version. I'll have to try that. REALLY Love this bird and the fact that you are making a great stab at it! KEEP UP THE GREAT WORK! I was looking at something very similar myself today.